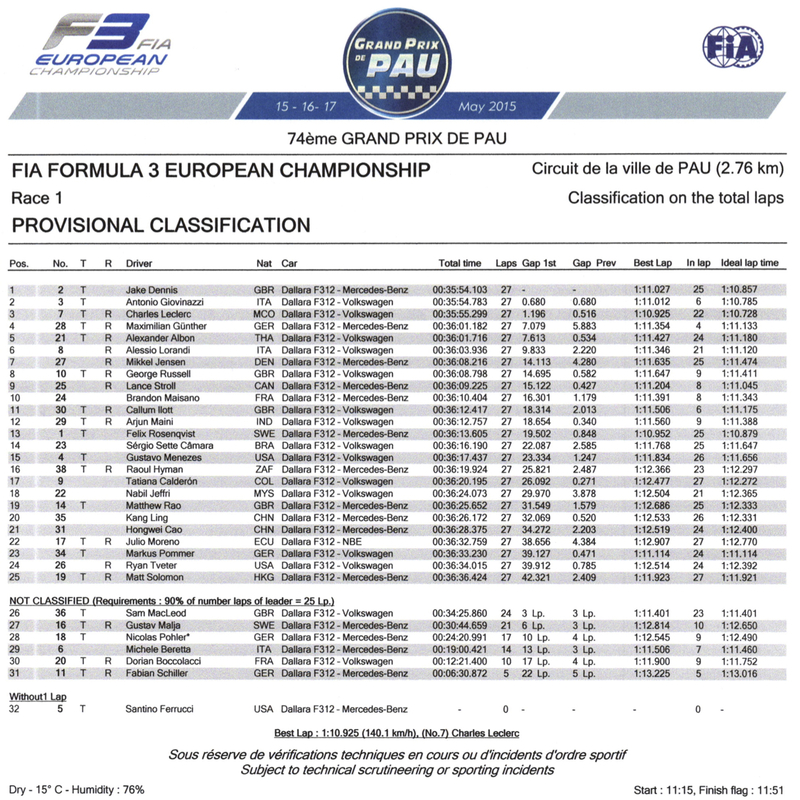 Jake Dennis swept to a stellar first FIA European F3 race victory in style at Pau this morning. In a race twice interrupted by the safety car, the Prema Powerteam driver led from the start, heading a close Antonio Giovinazzi and Charles Leclerc for the duration. Although Dennis’ lead was never more than 0.8s over Giovinazzi, the Briton rarely looked like losing this race, such was his prowess around the French streets, despite the 19-year-old claiming he was suffering from a car issue in early stages of the competition. Yet at the same time, Dennis was never in a position to relax. If anything, this race was more about the top three drivers pushing hard for the fastest laps throughout – a accolade eventually claimed by Leclerc – with the trio settling into laps around the late 1’10s and early 1’11s for much of the running. For each occasion the race was halted, Dennis did more than enough to gap to Giovinazzi when the race restarted and while the Italian regained the gap to Dennis, Giovinazzi was also watching his mirrors for the feisty Leclerc. Indeed Dennis was most under threat from Leclerc at the start. Although a decent start, Dennis’ van Amersfoort rival enjoyed an even better getaway initially with Leclerc drawing close through Courbe des Tribunes; however Leclerc was forced to withdraw as the bend tightened up, allowing the super fast starting Giovinazzi through to take 2nd position prior to Virage de la Gare, after which Giovinazzi’s chase began. Come 27 laps, Dennis claimed his first European Formula 3 victory and with an additional two pole positions in his pocket for Races 2 and 3, the Mercedes-powered man is in a good position to add to that tally this weekend. Giovinazzi was a winner to a degree too. By taking Leclerc, the Italian extended his lead at the top of the championship standings to 8 points, with fellow contender Felix Rosenqvist falling off the radar somewhat thanks to a 13th place finish. This race was no thriller by any stretch of the imagination, but it was a joy to watch three young drivers of quality pushing to the maximum within such tight confines. Behind the leading trio, Maximilian Günther continues to showcase his talents with drive to 4th place, while holding Alexander Albon at bay, while Alessio Lorandi picked up his first points of the year with a drive to 6th. Lorandi’s top six came after an incident with Callum Illot took the Red Bull driver out of contention. Mikkel Jensen claimed 7th ahead of George Russell, although Russell did his best to force his way around the Dane and almost lost a place to 9th place Lance Stroll as a result. 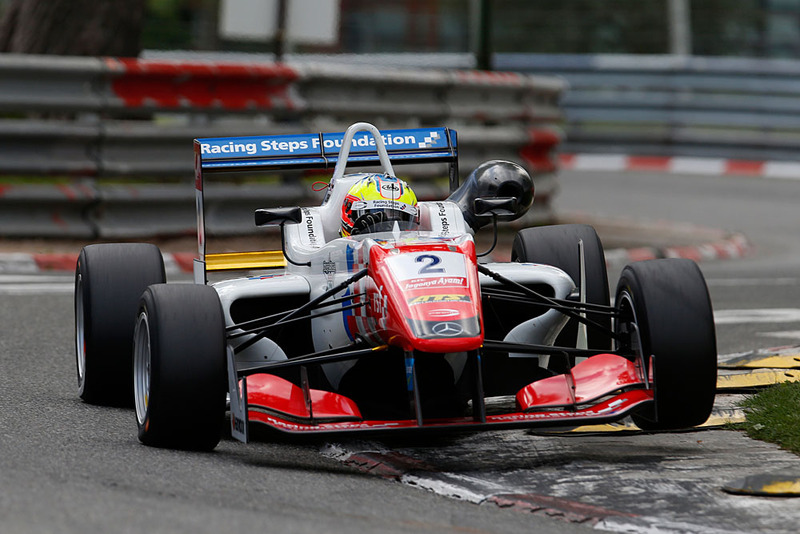 Stroll initially followed Prema Powerteam teammate Brandon Maïsano, but took the Frenchman just prior to the second safety car period on lap 15 – the pair came home 9th and 10th. Both safety car periods were caused by cars hitting barriers. The first was when the then 15th placed Dorian Boccolacci stopped after the Chicane du Croisement on lap 12. After a brief neutralisation, the race was live for less than a lap when Michele Beretta crashed under Pont Oscar on lap 15. The timing of the first safety car period caused some confusion between Gustavo Menezes and Felix Rosenqvist, with the latter seemingly having believed he had passed Menezes before the yellow flags emerged. Rosenqvist was later ordered to give the position back, although it came to nothing when Menezes dropped down the order on the final lap anyway – however it is unlikely Rosenqvist will be in any way happy with 13th position when there is a title to fight for. © FAI F3 Media Services.